Our house is located approx 20 kilometres north of the Sydney central city area in a suburb called South Turramurra which backs onto the Lane Cove River Park. About 2.15 pm we were watching a media briefing by the Rural Fire Service Commissioner, Phil Koperberg, on Sky News when he was interrupted by a phone call. 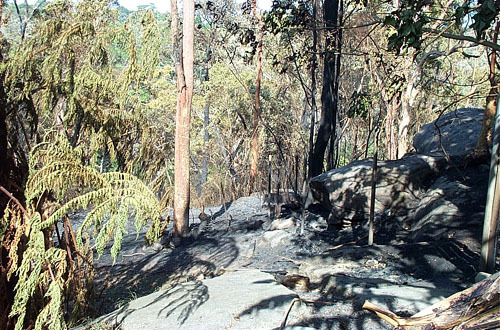 He returned to say that a new fire had started at Pennant Hills Park at approx 2pm. PHP is 3 km northwest of us. 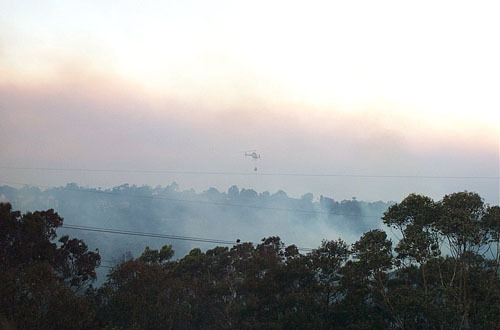 Shortly after this the heavy helicopter ('Elvis') appeared to the west going northwest towards the fire. This helo carries 9,000 litres and can reload via a snorkel in 45 seconds. Several media and survelliance helicopters also appeared. One Metropolitan Brigade unit and 2 Rural Fire Service units were in the street. Elvis was reloading somewhere in Macquarie Park to the south. We noticed after 7 or 8 runs that its path had moved from west of, to straight overhead, then to the east indicating a new approach to the fires moving closer. Not happy Jan. We put clothes, photos, PC, dogs and cat into the car. Opened the garage door and moved the bike to the front. Left my helmet and jacket next to it with keys in. We damped down the house (half brick/half wood) but water pressure was dropping cause everybody was doing it. At 4.45 pm the police came and told everybody to get out. I went back into the house thinking I might stay. I looked out the back windows and could only see thick smoke (no flames). Then I heard the trees cracking, okay I'm out of here. Louise took the car and I took the bike and we went a kilometre north to a local park where others had gathered. After about 30 minutes I walked back but the Police would not let us into Bowen Avenue. At 6 pm they let us in and we walked down. No damage to the house. Our back fence is half gone with two odd burn spots one on each side fence. Minor damage to the garden. 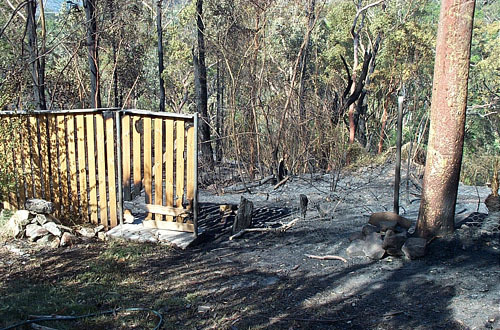 We spent the next hour damping down embers in the garden, fence and bush. The bush in Lane Cove River Park (that we back on to) is about two thirds gone, a bit like a moonscape. One house 2 down from us had its balcony rail charred but that was it for our street. 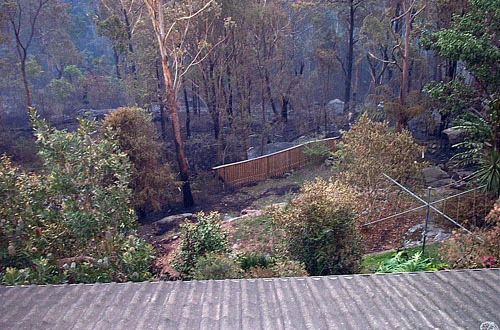 Almost every house on the western side of the street had its rear fence burnt (about 20 houses).